In this book, Gilbert Paquette–an internationally recognized expert in the field of technology-based training–offers IT professionals, trainers, and consultants a revolutionary method for going beyond simple information management. Instructional Engineering in Networked Environments introduces the instructional engineering method that elicits knowledge from subject matter experts to make information more widely available for training other people and transfering knowledge through formal and informal training using a variety of media and information sources. Throughout the book, Paquette shows that instructional engineering is based on the use of transferable graphic models that demonstrate how this engineering works in an environment with human networks and diversified information sources. This important book also includes illustrative examples of "artifacts"–the actual job aids that hold an organization’s knowledge–and provides numerous easily reproducible tools. "The tools and methods developed by Dr. Paquette and his team at LICEF since 1992 are generally regarded by the International Board of Standards for Training, Performance and Instruction (IBSTPI) as world class in every respect. The board believes that an institution or organization embarking on serious efforts in distance and distributed learning would do well to consider these methods and tools as setting a standard." "Gilbert Paquette's work is truly world-leading and needs much more exposure. I was so impressed with his detailed models for knowledge engineering in telelearning systems. It was the first time in years that I thought someone had created a breakthrough." "Hydro-Quebec groups over 19,500 employees and employs a staff of around 300 trainers and instructional designers. We have been using the MISA method and the MOT knowledge editor for several years now, and we have not yet found a method as efficient, even though we have had many sales pitches by different vendors." 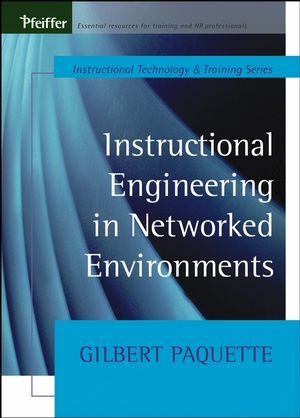 "In this book, Professor Paquette provides one of the most sophisticated tools yet developed for a true technology of instructional engineering. All serious instructional designers will find that this work significantly improves the efficiency and effectiveness of their instructional development efforts." Gilbert Paquette is a professor at Tele-universite du Quebec, acting as director of the CIRTA Research Centre, an interuniversity research center hosted by the LICEF research center at Tele-universite. He is leading two important Canadian projects in the field of e-learning: eduSource and LORNET. Paquette has published three books and numerous articles and has supervised and participated in a dozen multimedia teletraining courses and many computer-based training environments.